Mountain Ash (Welsh: Aberpennar) is a town (and former community) in the Cynon Valley, within the County Borough of Rhondda Cynon Taf, Wales. At the 2001 census, Mountain Ash had a population of 7,039 increasing to 7,374 at the 2011 Census. 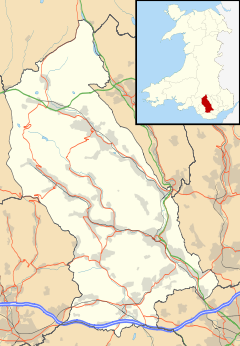 [not in citation given] The Mountain Ash geographical area incorporates and includes the districts and villages of Cefnpennar, Cwmpennar, Caegarw, Darranlas, Fernhill, Glenboi and Newtown. Mountain Ash lies within the historic county boundaries of Glamorgan. The town lies about 4.5 miles south of the town of Aberdare and approximately 19 miles northwest of Cardiff. The village and community of Penrhiwceiber lies around a mile south of Mountain Ash. From an administrative point of view, Mountain Ash is split into two electoral wards: Mountain Ash West takes into account the town centre, together with the districts of Miskin, Darranlas, Fernhill and Glenboi; Mountain Ash East comprises the remaining districts of Cefnpennar, Cwmpennar, Caegarw and Newtown. Unlike other villages in the South Wales Valleys, it remained quiet, being only disturbed in 1818 by the construction of the Aberdare Canal, which became disused in the early 20th century, and was filled in to form the New Cardiff Road in 1933. The population of the village was 1,614 in 1841, rising to 11,463 in 1871 with the opening of local collieries. The 1851 census shows the construction of Duffryn Street and Navigation Street. By 1859 there were 12 public houses, some of the earliest being the Bruce Arms, the Junction Inn and the New Inn. By 1920, Kelly's Directory lists over 200 businesses within the village. The coal industry had started to decline after the First World War, but after the Second World War factory industries were introduced to offset the serious fall in local mining employment. By the end of the 20th century the last coal mines had closed, and many of the town’s factories had ceased operation as well. New light industries and service activities only partly mitigated the resulting economic hardship. Mountain Ash along with the rest of the Cynon Valley and all the other South Wales Valleys was predominantly a Welsh speaking valley up until the 19th century. On 1 December 2016, following The Rhondda Cynon Taf (Communities) Order 2016, the community of Mountain Ash was split into two new communities, Mountain Ash East and Mountain Ash West, which are coterminous with the electoral wards of the same names. There were numerous nonconformist chapels at Mountain Ash. Of the Welsh language chapels only Bethania (Independent) remains open today. Bethlehem (Calvinistic Methodist) has closed. There was another Independent chapel at Bethel, Miskin. Like other communities in the Cynon Valley, Mountain Ash was affected by the Religious Revival of 1904-05. One of the most striking events took place on a Friday evening in late January when a procession paraded through the main streets of the town before a revivalist meeting was held at Bethania Chapel addressed by the Rev Penar Griffiths. The town is served by Mountain Ash railway station on the Aberdare branch of the Merthyr Line of the Transport for Wales rail network. Further to Mountain Ash railway station, the village of Fernhill and Penrhiwceiber is also served by the Aberdare line. Bus services are operated by Stagecoach in South Wales. The ex-GWR Pannier Tank No.7754, in preservation at the Llangollen Railway. Through operating on the NCB Mountain Ash railway, it became the last British mainline-built operating steam locomotive in the UK, until it ceased operations in 1975. An early British railway line had developed from the industrial development within the South Wales Valleys, which with its core centred around Mountain Ash became known as the Mountain Ash Railway (MAR). Having developed from an early tramway, it became in the 1970s the last core of steam locomotive operations in the UK. Developed by Powell Duffryn as it consolidated various industrial assets, the railway started across from Afon Cynon at the Penrikyber Colliery, heading north past a coal stocking area at Pontcynon, then past the Mountain Ash interchange yard (known as the Lansdale Yard) and through the former Nixon's Navigation colliery - home of the railway's central workshops, locomotive sheds and weighbridge - and on north past Duffryn Colliery, terminating at the Abercwmboi Phurnacite plant. The railway's main access to the UK rail network was via the Vale of Neath Railway's station at Mountain Ash (Cardiff Road) railway station, although it also had access to the competing and dominant Taff Vale Railway. Early locomotives were drawn from all of the major UK industrial locomotive makers, but like many industrial railways post-World War II the operational fleet were based around a core of group of Hunslet Austerity 0-6-0STs. In 1959 the National Coal Board (NCB) acquired ex-GWR Pannier Tank No.7754. Although rather too heavy to work on the relatively light-rail of the MAR - which was also poorly maintained, which resulted in regular spreading of the rails - after a refit in the late 1960s, it became a favourite with MAR crews. It eventually became the last British mainline-built operating steam locomotive in the UK, until it ceased operations in 1975 following a cylinder valve crack. The NCB were persuaded to donate the locomotive to National Museum Wales, who have since loaned it indefinitely to the Llangollen Railway. The MAR closed in the mid-1980s, after the miners' strike. Mountain Ash is served by Mountain Ash Comprehensive School for pupils aged 11–18. The comprehensive school is situated on the site of the former estate of Lord Aberdare. The main house, Dyffryn House, was still used by the school until its demolition in the 1990s. Opposite the site of the secondary school is the hospital Ysbyty Cwm Cynon which opened in 2012 replacing the old Mountain Ash General Hospital. Local primary schools include Our Lady's R.C Primary School, Caegarw Primary School (Ysgol Gynradd Caegarw), Glenboi Primary School (Ysgol Gynradd Glen-boi), Darranlas Primary School (Ysgol Gynradd Darren-las), Miskin Primary School (Ysgol Gynradd Meisgyn), Penguelan Primary School (Ysgol Gynradd Pengeulan) and Penrhiwceiber Primary School (Ysgol Gynradd Penrhiwceibr). Mountain Ash has a rugby union team called Mountain Ash RFC. Rugby league club South Wales Scorpions also currently play their home matches in Mountain Ash. Nos Galan (Welsh: Rasys Enwog Nos Galen), is an annual 5 kilometres (3.1 mi) running road race, run on New Year's Eve to commemorate the first race of Guto Nyth Bran. Started in 1958, it now attracts 800+ runners and 10,000 people to the associated street entertainment. In 1974, Mountain Ash RFC Singers male voice choir were formed from a group of ex-players. Mountain Ash hosted the National Eisteddfod in 1905 and 1946. Mountain Ash served as the inspiration for the fictional town of Aberowen in Fall of Giants and the rest of the Century Trilogy written by Ken Follett. The town also appears in the Danny Wallace's 2005 memoir Yes Man. ^ "Census 2001 : Parish Headcounts : Rhondda Cynon Taf". Office for National Statistics. Retrieved 10 January 2010. ^ a b "Mountain Ash". Rhondda Cynon Taff. Archived from the original on 2011-07-18. Retrieved 2009-01-01. ^ "The Revival". Aberdare Leader. 4 February 1905. p. 2. Retrieved 9 November 2016. ^ Jones 2014, pp. 169–70. ^ "Wales stars help warm up Nos Galan runners". South Wales Echo. 2010-01-01. Retrieved 2010-01-01. ^ "Interview: Ken Follett on His Latest Historical Fiction Masterpiece, Fall of Giants". Gothamist. Retrieved 30 June 2013. This page was last edited on 31 March 2019, at 20:34 (UTC).